The USS Abraham Lincoln is one of the most powerful weapons on Earth. As tension mounts with North Korea and the deployment of intercontinental nuclear missiles, the USS Abraham Lincoln might be one of Donald Trump's strongest forms of deterrent. What may surprise you is the following... The majority of its employees are totally engaged Millennials. The USS Abraham Lincoln is almost 1100 feet (332 m) from aft to stern. You could fit three full football fields on its deck. It has a working crew of 5500 sailors, literally a floating city that even has its own dental clinic. But its function is not to clean teeth. 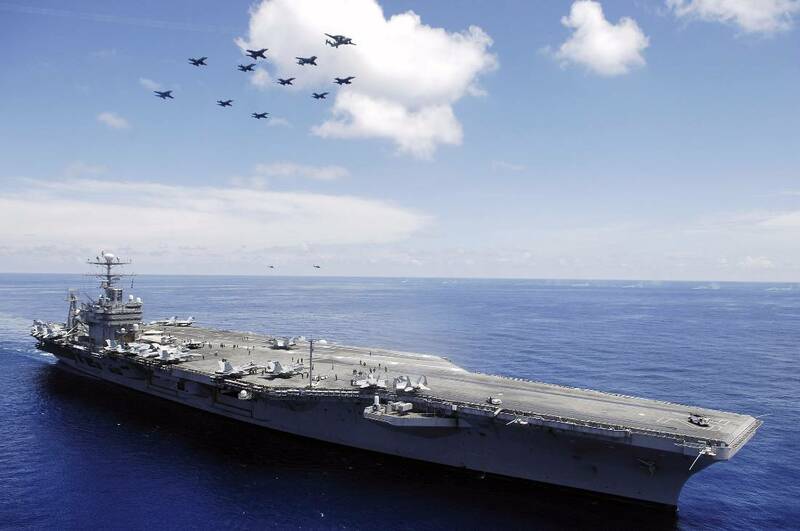 The USS Abraham Lincoln is a Nimitz-Class, nuclear powered aircraft carrier capable of launching intercontinental warheads, Tomahawk cruise missiles, and upwards of a hundred of the most technologically advanced fighter jets in the world. Its function is to protect our way of life and provide us with the security we need to pursue our goals and visions for our future. And it's operated by a bunch of 19 year olds. The reason I know *that* particular piece of information was because I experienced this fact first hand. I was fortunate to be invited onboard this battleship along with my ten year old son. We were escorted through a private VIP tour of the Abraham Lincoln by two of its senior officers who had previously attended lectures I had presented on the creation of synergy in the workforce (aka: working together with a common vision and purpose). My son and I were not just able to just walk along the upper deck, we were permitted to go below decks to see fully armed F-16 Tomcats, given a tour of the living quarters, mess halls (think: cafeterias) and yes, even their medical and dental clinics. The highlight was when my son was allowed to sit in the Admiral’s chair, which was, quite literally, the “seat of power” for the US Pacific Fleet. So what does this have to do with Millennials? The senior officers who gave my son and I this private tour explained how the average age of the 5500 the sailors onboard averaged out to just over 19 years of age. We’re talking teenagers. Right out of high school. Sure, the Abraham Lincoln’s Admiral was a senior veteran with decades of naval experience, as were my two hosts and a number of the ship’s other officers. But my hosts made a point of clearly giving credit to the thousands of young sailors which comprised the majority of the Abraham Lincoln’s crew. They explained how these young adults had been entrusted to perform hundreds of daily standard operating procedures, which enabled one of the world’s largest battleships to function effectively, efficiently, and in the heat of battle, proficiently. And my hosts were eager to explain to me the importance of the role that the youngest members of the crew performed, because they knew that in my professional endeavors one of the biggest complaints I hear from senior officers in the business world is the age old myth that “Young people don’t know how to work”. What they’re complaining about is a lack of workplace engagement amongst Millennials. There is no such lack of workplace engagement onboard the USS Abraham Lincoln. For that matter, I believe there is no lack of workplace engagement within the ranks of most Western defense organizations. Military personnel are taught, trained and mentored to understand the purpose and function of their role in society. They protect our freedoms, our borders, and even our local and national economies which provide us all with the safety and opportunity to pursue our goals for life. On the USS Abraham Lincoln, I witnessed what can be accomplished by thousands of young adults when they have a sense of purpose and function. I have also seen this same kind of employee engagement in other successful organizations that believe in creating the kind of corporate culture where all hands are valued and all hands are on deck. The next time you hear the myth “Young people don’t know how to work” just remember that while senior veterans and corporate officers may hold the seats of power, the real work of any effective, efficient and proficient business or organization is typically performed by a crew of junior employees.